Chennai, Aug 8: DMK patriarch and five-time Tamil Nadu Chief Minister Muthuvel Karunanidhi was finally laid to rest on Wednesday alongside Jayalalithaa, DMK founder CN Annadurai and MGR at Marina beachfront in Chennai as a sea of humanity bid him a tearful farewell. He was buried with full state honours next to his mentor and former chief minister C N Annadurai at the Marina beach. No Hindu rituals were performed as Karunanidhi was a self-proclaimed atheist and rationalist. Karunanidhi's son M K Stalin received the national flag wrapped around his father's body. Other family members including the leader's wife Rajathi Ammal, other sons and daughters showered flower petals at his feet. Draped in a tricolour, the five-time chief minister was taken for his burial in an open procession. A sea of supporters were lined up along the route to catch a final glimpse of the departed leader and chanted slogans for their Thalaivar. The last journey of 'Kalaignar' Karunanidhi began at 4:00 pm. The 94-year-old Dravidian icon, who was affectionately called as Thalaivar and Kalaignar, had breathed his last at Kauvery hospital after fighting for life for 11 days. He had been battling age-related ailments for a long time. Earlier today, leaders from across the country, including Prime Minister Narendra Modi and Congress president Rahul Gandhi, came to Chennai to pay their last respects to the doyen of Tamil Nadu politocs who breathed his last at Kauvery hospital in Chennai on Tuesday. Several Chief Ministers and political leaders paid tribute to late DMK chief M Karunanidhi at the Rajaji Hall here today. Karnataka Chief Minister H D Kumaraswamy, Kerala CM Pinarayi Vijayan, Telangana CM K Chandrasekhar Rao, CPI(M) general secretary Prakash Karat, former chief ministers of Kerala and Uttar Pradesh, Oommen Chandy and Akilesh Yadav respectively, among other leaders paid homage to the departed leader. The 94-year-old leader, who will be remember as one of the founders of the Dravidian movement and a much-loved chief minister of Tamil Nadu, breathed his last at the Kauvery Hospital in Chennai on Tuesday evening after fighting for life for 11 days since July 28. Governor Banwarilal Purohit pays his last tributes and salutes. The tri-services band plays in the background., followed by a moment of silence. A grieving Stalin stands at the feet of Karunanidhi with the flag that was handed over him by the Army. 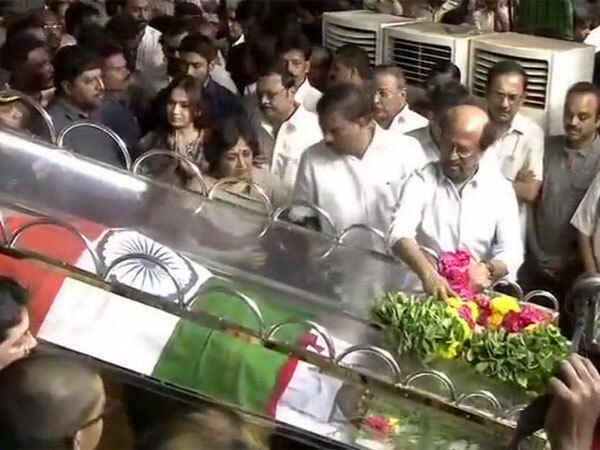 Trinamool Congress leader Derek O Brien, Congress President Rahul Gandhi, Veerappa Moily, Chandrababu Naidu and other top politicians pay their respects to Karunanidhi. Army personnel take out Karunanidhi's casket out of the truck for the final rites of the DMK patriarch at Marina Beach. DMK working president MK Stalin, who was at the head of the funeral procession with Kalanidhi Maran, enters the memorial. 'Man who never rested is now resting,' reads message on Kalaignar's casket. These words were picked out by the Kalaignar for his ‘tombstone’ 30 years ago. Known for his love affairs with poetry and literature, the message sums up the Kalaignar’s life as seen by his supporters and well-wishers. Several politicians, including Rahul Gandhi, are waiting at Marina beach where Karunanidhi will finally be laid to rest. The hearse is on its way to the Marina beach about 1.7 km from Rajaji Hall with thousands of people lining up on the roads to catch a last glimpse of the departed leader. Hundreds of people sporting black shirts and carrying pictures and banners of the late leader are following the hearse. Karunanidhi's body is draped in the national tri-colour with his trademark black glasses, yellow shawl, white shirt and dhothi on. Karunanidhi's funeral procession is enroute Marina Beach where he would be laid to rest alongside his mentor Annadurai. Thousands on streets to pay homage to their beloved leader, M Karunanidhi. AS per some estimates, over a lakh people are on streets. Meanwhile, DMK leaders have reached Marina Beach where Karunanidhi would be buried. Former J&K CM Farooq Abdullah, NCP President Sharad Pawar & Congress leader Praful Patel pay tribute to the DMK Chief M. Karunanidhi at Rajaji Hall. "Karunanishi always stood firmly for socialism and federalism...Country has lost greatest champion of social justice.. We have lost a personal friend," says Congress' Veerappa Moily. "The void left by Karunanidhi can never be filled. 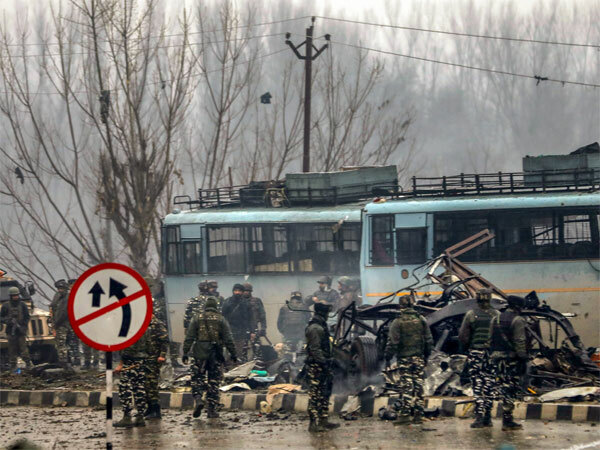 It is a great loss for the country," says Ghulam Nabi Azad. "Karunanidhi was the only politician with so many qualities in one person... 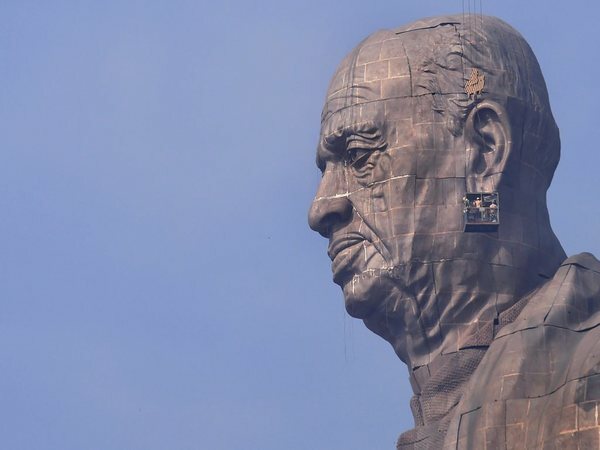 He also fought for social equality, for the downtrodden and for self esteem... His work work and ideology will remain a guiding factor for all of us," says Congress' Ghulam Nabi Azad. Kerala Chief Minister Pinarayi Vijayan, Governor P. Sathasivam, and Congress leader Ramesh Chennithala pay tribute to the late DMK Chief. Two persons died in stampede, one man and a woman. Both are said to be above 60 years of age. Two dead in stampede at Rajaji Hall. Stalin has blamed the ruling AIADMK government for stampede. He said that the EPS government deliberately lowered the security. Over 40 p[eople are said to be injured. Chief Minister of Telangana K Chandrasekhar Rao pays tribute to M karunanidhi at Rajaji Hall in Chennai. Congress president Rahul Gandhi reaches Rajaji Hall to pay last respects to Karunanidhi. RJD's Tejashwi Yadav and SP's Akhilesh Yadav arrive at Rajaji Hall with MK Stalin to pay homage to Karunanidhi. There a massive crowd at Rajaji Hall. The riot police have been called in manage the crowd. Some people have been injured due to the stampede. DMK working president MK Stalin appeals to party cadres to remain calm and maintain peace. " I did not want anything for myself. All I want is a fitting tribute to Kalaignar," he said. The police have blocked the entry to Rajaji Hall, where Karunanidhi's mortal remains have been kept, due to massive crowd. Reports say that people are trying to scale walls to enter the hall. Karunanidhi's last rites would be held this evening. His mortal remains are currently kept in Rajaji Hall for supporters to pay tribute. The funeral procession would begin from Rajaji Hall at 4 pm. The late Tamil Nadu Cm would be laid to rest at Marina Beach besides the memorial of his mentor Annadurai. A scuffle has broken put between the police and the crowd at Rajaji Hall where Karunanidhi's mortals remains are kept. Police have resorted to lathicharge, reports ANI. Prime Minister Narendra Modi is in Chennai to pay homage to Karunanidhi who passed away yesterday. A huge crowd gathers at Chennai's RajajiHall where mortal remains of M Karunanidhi are kept. Beach Road from War Memorial to Anna Samadhi flooded by DMK cadres. Rapid Action Force uses mild lathicharge to control the crowd outside Rajaji Hall. MTC buses stopped plying in the city. Many DMK cadres use MRTS and suburban EMU train services to reach Chintadripet MRTS railway station, close to the Rajaji Hall venue. Karnataka chief minister HD Kumaraswamy and deputy chief minister G Parameshwar arrive at Rajaji Hall to pay last respects to late Tamil Nadu chief minister M Karunanidhi. A team of DMK workers and leaders have gone to Anna mausoleum to identify the place where Karunanidhi’s body to be laid rest. DMK workers gather at Rajaji Hall where the mortal remains of M Karunanidhi are kept. Prime Minister Narendra Modi talks to MK Stalin and Kanimozhi after paying last respects to M Karunanidhi at Chennai's Rajaji Hall. Prime Minister arrives at Rajaji Hall to pay last respects to M Karunanidhi. Rajya Sabha and Lok Sabha adjourned for the day as a mark of respect to former CM M Karunanidhi. DMK’s Duraimurguan announces to the cadre the HC verdict which permitted Karunanidhi’s body to be buried at Marina. Stalin and Kanimozhi break down after hearing HC verdict. PM Modi arrived at Chennai airport and headed to INS Adyar near Napier Bridge by an exclusive helicopter. From INS Adyar - Navy helipad, PM Modi will reach the venue Rajaji Hall by road through VVIP entrance. DMK chief supporters outside Rajaji Hall welcome Madras High Court order, allowing the late leader to be buried at Marina Beach. The Madras High Court has said that Karunanidhi’s body will be buried at Marina. Petition by DMK allowed. Parliament to pay tribute DMK chief, likely to be adjourned. Secretary-General of the Marumalarchi Dravida Munnetra Kazhagam (MDMK) Vaiko is inside Rajaji Hall to pay respects to Karunanidhi. Actors Vishal, Nandha and Suhasini Maniratnam also paid tributes to the veteran leader. Prime Minister Narendra Modi arrives at Chennai Airport.Security beefed up as PM arriving at the venue. 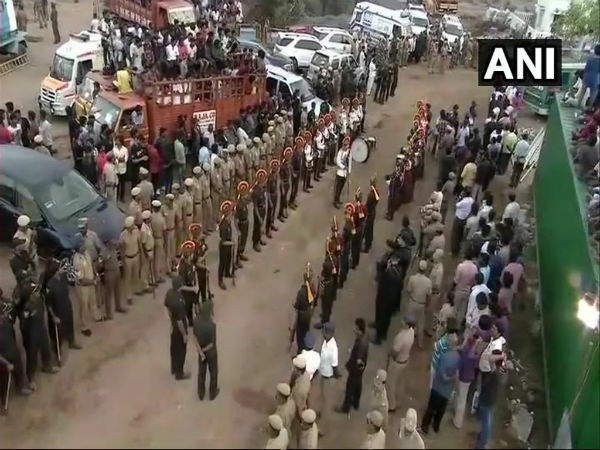 Chennai Police allow cadres to pay their respect in batches of 200. Former Chief Minister of Uttar Pradesh Akhilesh Yadav leaves for Chennai to pay last respects to late Tamil Nadu CM M Karunanidhi. "I express my condolence to his family and I express my gratitude to Karunanidhi. I have already spoken about the marina issue, this is not the right place for me to speak about the issue," Kamal Haasan says after paying tribute to Karunanidhi. Actor-turned-politician Kamal Haasan pays last respects to former CM M Karunanidhi at Chennai's Rajaji Hall. Prime Minister Narendra Modi is likely to arrive in Chennai at 11 am to pay last rites to former Tamil Nadu chief minister M Karunanidhi. Former Prime Minister and senior Congress leader Manmohan Singh expressed his condolence on the death of DMK President M. Karunanidhi and wrote to his son M.K Stalin saying that the country has lost a versatile genius. 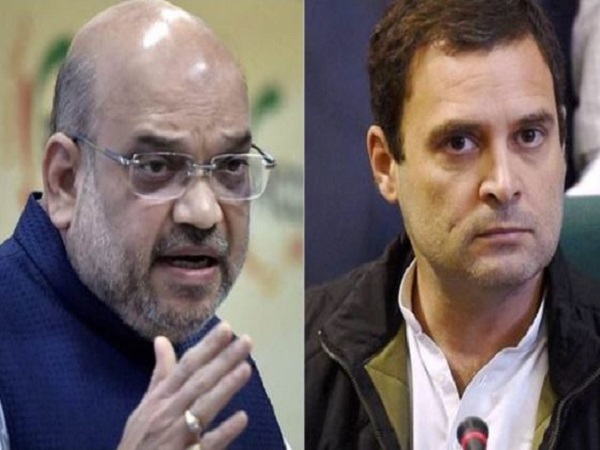 President Kovind, Delhi CM Arvind Kejriwal and Rahul Gandhi will arrive in Chennai for last respects to M Karunanidhi. Heavy security outside Anna Memorial at Marina beach. Hearing in the case against denial of burial land by Tamil Nadu Govt at Marina beach for M Karunanidhi is underway at Madras High Court. VCK president Thol Thirumavalavan pays last respects to former Tamil Nadu CM M Karunanidhi at Chennai's Rajaji Hall. Deepa Jayakumar pays last respects to former Tamil Nadu CM M Karunanidhi at Chennai's Rajaji Hall. Madras HC has dismissed the petition filed by Traffic Ramaswamy, which challenged the construction of memorials at Marina. RAF team arrives at Rajaji hall, where mortal remains of Karunanidhi have been kept. Former Kerala CM Oommen Chandy pays last respects to former Tamil Nadu CM M Karunanidhi at Chennai's Rajaji Hall. A R Rahman: 'Your infectious passion for Tamizh will stay with us' A R Rahman tweets, "You may have left this earth but your infectious passion and love for Tamizh will stay and reflect with us forever…Deep Respect !" Karunanidhi’s body has been wrapped in tricolour, wearing the trademark dark yellow glasses. Tamil Nadu Governor Banwarilal Purohit pays last respects to former Tamil Nadu CM M Karunanidhi at Chennai's Rajaji Hall. "Karunanidhi showed the way for regional parties. He was not just a regional leader, he was a national leader. His passing away has come as a shock to me," says JD(S) chief and former Prime Minister HD Deve Gowda. This is a great loss for Tamil Nadu. My deep condolences to his family members and DMK party workers: Tamil Nadu CM E Palaniswami. Several leaders will be flying to Chennai to pay their last respects to the departed leader. 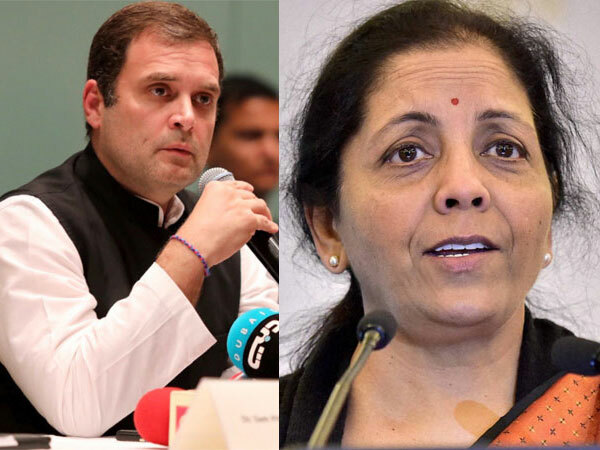 Prime Minister Narendra Modi and Congress president, Rahul Gandhi would be in Chennai. Tamil Nadu CM, E Palanisami arrives at Rajaji Hall to pay his respects. 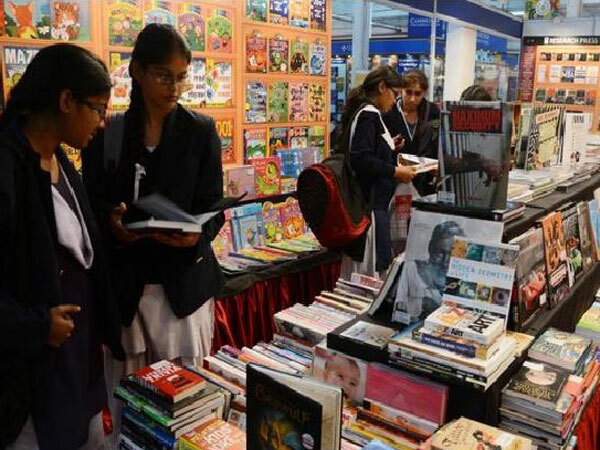 He is accompanied by deputy CM, O Paneerselvam, Lok Sabha Deputy Speaker M. Thambi Durai, Education Minister K.A. Sengottaiyan, AIADMK MLA D. Jayakumar and other AIADMK members. Actor Rajanikanth arrives to pay his last respects along with his wife, Latha, daughter Aishwarya and son-in-law Dhanush. Veteran actor Radha Ravi arrives at Rajaji Hall to pay his last respects. Ravi was closely associated with Karunanidhi during his days in the movies. A copy of his brainchild Murasoli is kept besides Karunanidhi’s body. 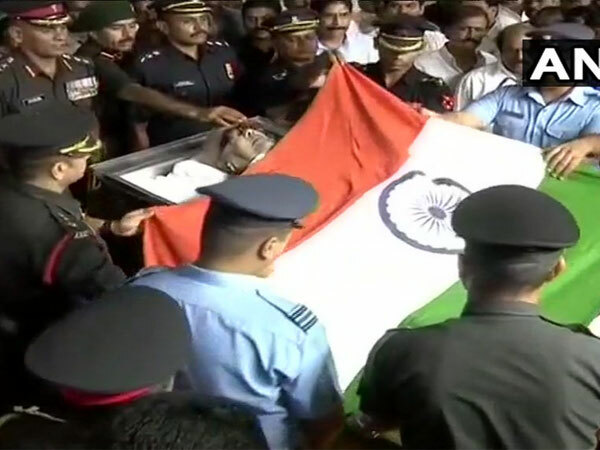 Armed forces wrap Karunanidhi’s body in tricolour as a mark of respect. The body lies at state at the Rajaji Hall. Sloganeering continues by DMK workers demanding that Karunanidhi be buried at the Marina Beach. The HC would continue hearing the petition at 8 am. 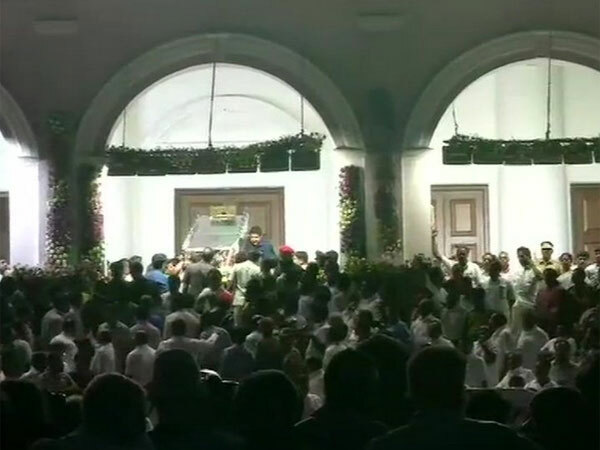 The mortal remains of Karunanidhi arrived at the Rajaji Hall after a 5 kilometre long journey that took about 30 minutes. Terrible lapse at Rajaji Hall. Body moves down inside the casket abruptly, as it is mounted on on an elevated dais. The DMK argued that the law has not changed between the death of Karunanidhi and Jayalalithaa and hence his body should be buried at Marina. Activist Traffic Ramaswamy told the court that his petition relates to the relocation of the mausoleums of Anna, MGR and Jayalalithaa. The larger question can be decided after Karunanidhi is buried at Marina. Justice Hulavadi G Ramesh tells TN government that the more time you take on deciding, the more trouble you may have to face in maintaining law and order. 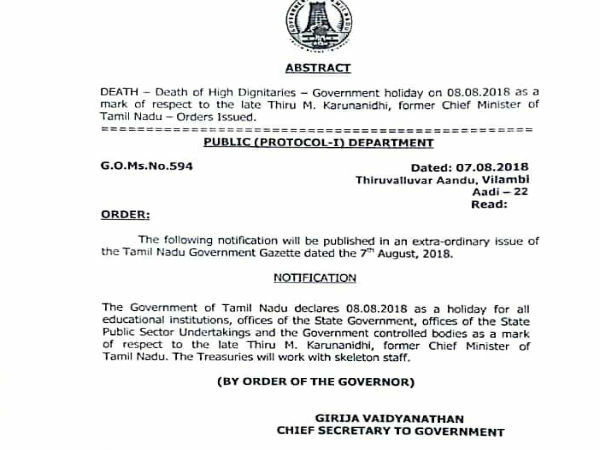 The TN government cited protocol as the reason for burying Jayalalithaa at Marina. However the DMK said that protocol is not the law. Tamil Nadu based advocate Duraiswamy has said that he had withdrawn his PIL. He alleged that there were "political motives behind not allowing Karunanidhi's burial at Marina beach" and said that his petition had nothing to do with providing Karunanidhi a place beside his political God-father Anna Durai. The petition was in fact against the burial of Jayalalithaa, he also said. The DMK will argue that Karunanidhi should be allowed to be buried at Marina given his political stature. In total there were five petitions pending in the HC on the issue relating to the burial of leaders at Marina. However with the death of Karunanidhi, four of the five have been withdrawn. When Anna was there to safeguard and promote general Kazhagam, there were two brothers- Kalaignar (M Karunanidhi) and MGR, and to see all three of them at one place would have been good: Kamal Haasan. 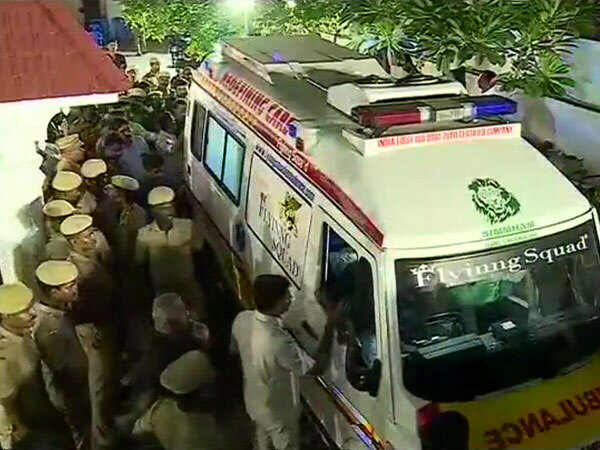 Ambulance carrying former Tamil Nadu CM M Karunanidhi's mortal remains arrives at Kanimozhi's residence in CIT Colony. 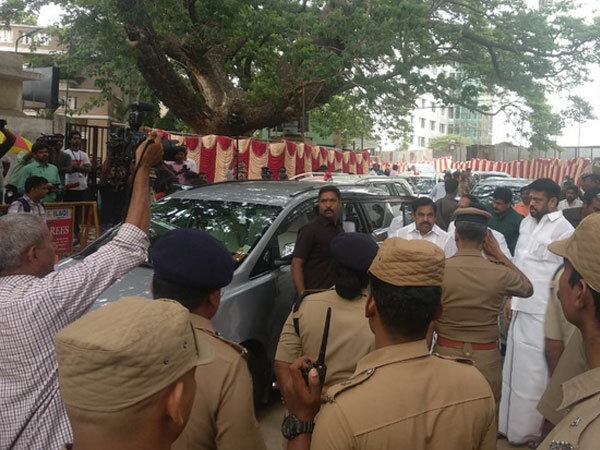 Rajinikanth returned from M. #Karunanidhi's Gopalapuram house without paying his final respects due to unmanageable crowd outside. Petitioner, S Duraisamy is not being allowed to enter the residence where the hearing is underway. DMK working president MK Stalin said in an interview that DMK supremo Karunanidhi's health is stable and that doctors are monitoring his condition at the hospital. On July 31, Congress president Rahul Gandhi met Karunanidhi and wished him a speedy recovery. Congress President Rahul Gandhi to travel to Chennai today to meet DMK chief M Karunanidhi who is admitted to Kauvery Hospital. Stalin says Karunanidhi's condition is stable and that the veteran leader continues to remain under keen observation of doctors. Representatives of Sri Lanka President, Maithripala Sirisena, visited Kauvery hospital to meet former Tamil Nadu CM M Karunanidhi. They submitted a letter from Sirisena to DMK working President MK Stalin wishing speedy recovery to Karunanidhi. NCP leader Sharad Pawar visited Chennai's Kauvery hospital today. He met M K Stalin and Kanimozhi and inquired about the Karunanidhi's health. Supporters of DMK chief M Karunanidhi pray at his residence in Coimbatore where he used to reside in 1945. He is currently admitted in Chennai's Kauvery hospital. DMK supremo Karunanidhi is fighting with Yaman (the God of death) but he will return victorious, said MDMK general secretary Vaiko Kaveri after visting him at Kauvery Hospital on Monday. Isha Yoga founder and spiritual guru Jaggi vasudev also visited DMK chief Karunanidhi at the Kauvery Hospital on Monday, News18 Tamil reported. AIADMK member Nanjil Sampath and famous Tamil poet Vairamuthu visited DMK chief Karunanidhi in Kauvery Hospital on Monday, according to local media reports. 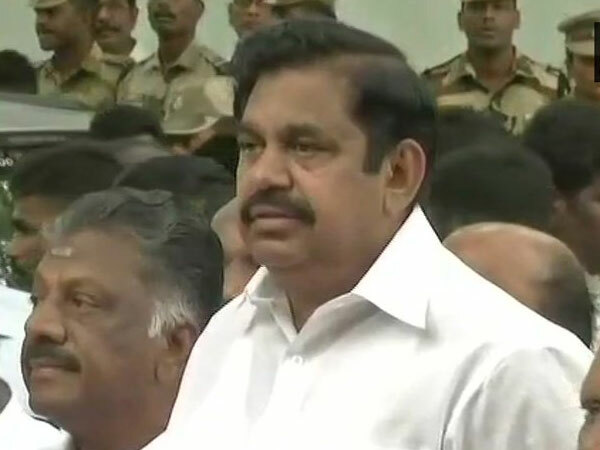 E Palaniswami met Karunanidhi in ICU. He said that the DMK chief is doing fine and a team of expert doctors team is monitoring him, according to reports. DMK volunteers need to maintain peace and cooperate with the police, MK Stalin requests to supporters. 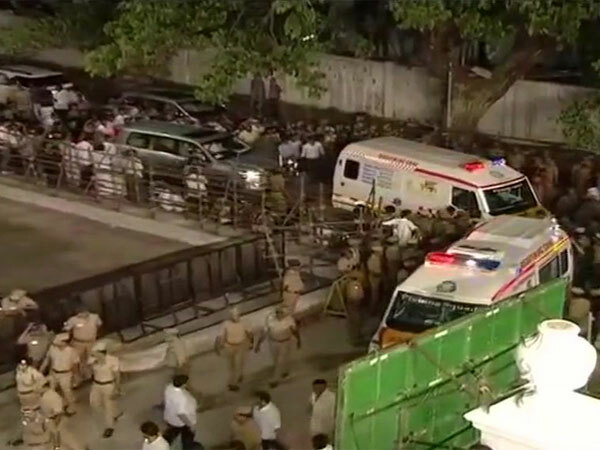 Tamil Nadu Chief Minister E Palaniswami and and deputy chief minister O Panneerselvam have arrived at the Kauvery hospital to enquire about M Karunanidhi's health, according to sources. DMK workers continue to gather outside Kauvery Hospital in Chennai where DMK Chief M Karunanidhi is undergoing treatment. According to Thanthi TV, DMK chief Karunanidhi's daughter Kanimozhi who had stayed at the hospital overnight has said that he is doing good and his well-wishers and party workers should be "brave" in these testing times. A DMK worker died of a heart attack in Thiruvarur on Sunday morning after hearing about the deteriorating health of party veteran M Karunanidhi. Another DMK worker, Raju, committed suicide by hanging himself on Sunday, according to local media reports. The security was beefed up both at the hospital and Karunanidhi's residence on Sunday. DMK leader A Raja, in an address to people outside Kauvery Hospital in Chennai, asked not to believe in rumours. Raja said, "Karunanidhi is responding well to treatment". A massive crowd has gathered outside Kauvery hostpital and a tight security has been put in place. Some reports had earlier said that Karunanidhi's condition was upgraded to 'very critical' from 'critical'. Tamil Nadu Chief Minister E Palaniswami, who was in Salem, has reportedly cancelled all his meetings and rushed for Chennai. Leaders cutting across party lines are arriving at Kauvery hospital. Massive crowds have gathered outside the hospital. People are shouting slogans "Long live Kalaignar". Karunanidhi was admitted to the Hospital in a critical condition around 1.30 a.m. on Saturday after his blood pressure began to fall. He was rushed to the hospital in an ambulance past Friday midnight from his Gopalapuram residence. Former BJD leader Bijayant Jay Panda earlier called on M Karunanidhi at Kauvery hospital today and wished for the DMK president's speedy recovery. "I came here to convey my best wishes for Karunanidhi Ji's speedy recovery. 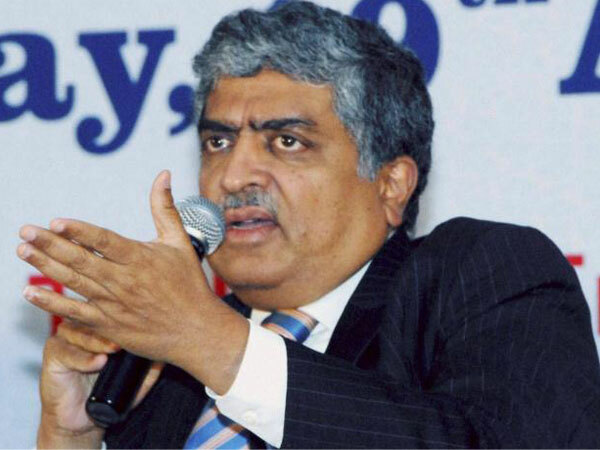 He has played a tremendous role in social transformation and economic development of the nation. I met MK Stalin, Kanimozhi and other DMK leaders," Panda told ANI after meeting. Vice President Venkaiah Naidu earlier today met the DMK Chief at Kauvery hospital where Karunanidhi is admitted following a drop in blood pressure. The crowd stayed put outside the hospital even past midnight. Despite assurances that Karunanidhi was recovering, the crowd refused to disperse. Anna University has announced that there has been no holiday declared for its constituent colleges. BJD leader Bijayant Jay Panda calls on M Karunanidhi. Vice President Venkaiah Naidu meets DMK Chief M Karunanidhi at Kauvery hospital where the former Tamil Nadu Chief Minister was admitted following a drop in blood pressure. DMK supporters gathered outside Chennai's Kauvery hospital, where DMK Chief M Karunanidhi was admitted following drop in blood pressure. Police personnel have cordoned off for the entire area for general public. Karunanidhi's condition has hogged attention over the past couple of days, with political leaders from across the spectrum lining up to visit him. Vice President Venkaiah Naidu will meet Karunanidhi at the hospital on Sunday. Former Tamil Nadu chief minister and DMK patriarch M Karunanidhi's health condition continues to remain stable with ongoing active medical support, said the latest bulletin issued by Kauvery Hospital in Chennai. The hospital statement said, "DMK President and former Chief Minister of Tamil Nadu, Kalaignar Dr M Karunanidhi's health condition continues to be remain stable with ongoing active medical support. He is continuously being monitored & treated by the panel of expert doctors in the Intensive Care Unit." TN CM E Palainiswami's statement: Karunanidhi was not feeling well & was undergoing treatment at home. Now, he is being given the best treatment at the hospital. Our ministers had met MK Stalin and inquired about his health. He will recover soon. If necessary we are willing to provide any help with medical aid. He is better. His blood pressure has stabilised: DMK leader Kanimozhi on DMK President M Karunanidhi's health condition. Tamil Nadu Governor Banwarilal Purohit met MK Stalin at Kauvery Hospital, where DMK President M Karunanidhi was admitted late last night. DMK supporters continue to gather outside Kauvery Hospital, where DMK President M Karunanidhi is admitted. Tamil Nadu governor Banwarilal Purohit visits DMK President M Karunanidhi at Kauvery Hospital who was admitted to the hospital late last night following a drop in blood pressure. MK Stalin arrived at Kauvery Hospital, where DMK President Karunanidhi is admitted following a drop in blood pressure. DMK supporters gathered outside Kauvery Hospital, where DMK President is admitted. Karunanidhi, 94, was admitted in the Intensive Care Unit of Kauvery Hospital at 1:30 am. After the hospital informed that Karunanidhi was responding to treatment, the crowd started to disperse. His family members including Stalin and former Union Minister Dayanidhi Maran too left the hospital. The hospital in a statement said he was brought there after his blood pressure had dropped. "His blood pressure has been stabilised with medical management and he continues to be monitored and treated by the panel of experts," the hospital said. Several senior DMK leaders, including working president M K Stalin and his estranged elder brother M K Alagiri were at the hospital. Other frontline leaders such as Duraimurugan, Rajya Sabha MP Kanimozhi and former Union minister A Raja were also there. Hundreds of party cadres and well-wishers have gathered at the hospital. Security beefed up in and around the area. Slogans like "Long Live Kalaignar Karunanidhi" rent the air. Earlier in the day, Kauvery hospital in Chennai released a medical bulletin stating that Former Tamil Nadu Chief Minister and DMK patriarch M Karunanidhi's health had deteriorated and a team of medical experts were treating him for fever due to urinary tract infection and had kept him under observation for 24 hours. "There has been a decline in the health of DMK president M Karunanidhi's due to age-related ailments. He is being treated for fever due to urinary tract infection. 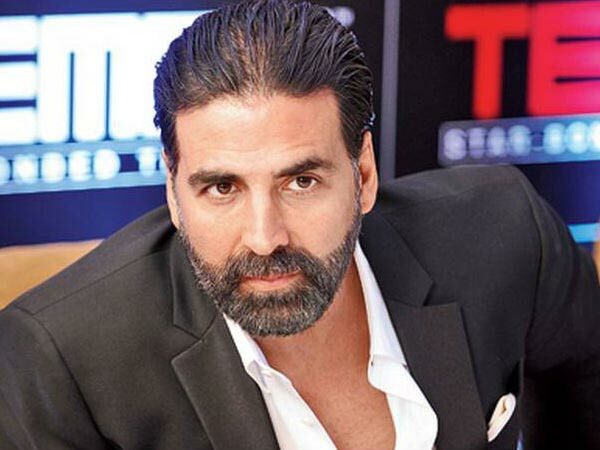 He is being given hospital level treatment at home," a medical bulletin released by the Kauvery Hospital said. Given his condition, the team of doctors attending to him has recommended the restriction on visitors. DMK working president and Karunanidhi's son, M K Stalin, told that the veteran leader is recovering steadily as his fever is coming down. News agency ANI quoted him as saying "he (M Karunanidhi) is recovering steadily as his fever is coming down." Stalin was made the party's working president in 2016 after Karunanidhi retreated from the mainstream politics. He tweeted: "I am thankful to Rahul Gandhi, SitaramYechury & D Raja for calling to inquire about Thalaivar Kalaignar's health. The concern and wishes from everyone will surely aid @kalaignar89's recovery and we hope he will be able to meet everyone soon." Meanwhile, Prime Minister Narendra Modi on Friday said that he spoke with Karunanidhi's son M.K. Stalin, who is the Leader of Opposition, and daughter Kanimozhi and enquired about the veteran leader's health. "I pray for his quick recovery and good health," wrote Modi on Twitter and added that he has offered any assistance required. Also, President Ram Nath Kovind spoke to Karunanidhi's family members, President's office tweeted, "Spoke to Thiru Karunanidhi's family members on the phone and inquired about his health. Wishing the former Chief Minister of Tamil Nadu, a veteran of our public life, a quick recovery." Arpudhamaal, the mother of Perarivaalan who is accused in the Rajiv Gandhi assassination case, visited Gopalapuram to meet Karunanidhi. West Bengal Chief Minister Mamata Banerjee took to Twitter to wish for Karunanidhi's speedy recovery. MK Stalin took to Twitter to thank PM Narendra Modi and Congress President Rahul Gandhi for enquiring about Karunanidhi's health. Senior Congress leader Ashok Gehlot took to Twitter to wish Karunanidhi a speedy recovery. Union Minister Pon Radhakrishnan said that meeting MK Stalin & Kanimozhi, he was apprised that Karunanidhi's health is improving and that PM Modi spoke to them inquiring about his health. Karunanidhi's house has been flooded with party workers today after Kauvery Hospital stated a "slight decline" in his health Thursday night. Among other visitors were, MDMK chief Vaiko, Tamil Nadu BJP chief Tamilisai Soundararajan, CPI leader D Pandian and Tamizhaga Vazhvurimai Katchi leader Velmurugan who enquired about his health from family members and Stalin. Karunanidhi completed 50 years as party chief today and the DMK had planned to celebrate it by distributing sweets and welfare assistance.